From the Museo Diocesano de Malolos, participants of the Automobile Association of the Philippines (AAP) caravan moved on to next room which houses the Museum of the Malolos Republic. Here, we were welcomed by Mr. Jose Ruel Paguiligan of the National Historical Commission of the Philippines (NHCP) and curator of the Barasoain Church Historical Landmark. The modernized museum, one of 22 museums throughout the country that the Aquino administration wanted upgraded into digitally-enhanced institutions in order to advance historical studies, was finished in 2012. It is a rich source of historical data, including documents and artifacts explaining how the Malolos Congress was put together on September 15, 1898. With the magic of modern technology, learning history lesson is now more fun and interesting. The upgraded museum was jointly funded by the NHCP and the Provincial Government of Bulacan headed by Gov. Wilhelmino M. Sy-Alvarado. It has five galleries, with the first two explaining the backdrop to the Malolos Congress to visitors. It boasts of interactive digital displays that allow students and other visitors to respond (however, it interacts only in Filipino) to a history quiz about the Philippine Revolution, making the presentation of history more interesting and, at the same time, more engaging. It also includes an E-learning room (designed for students and equipped with 22 computers containing interactive lessons in Philippine history), research facilities and an audio-visual room. Permanent collections of the museum include the original carriage used by Pres. Emilio Aguinaldo during the opening of the Malolos Congress and reproductions of stereographic cards of the Philippine-American War. Gallery 1, the ante room, presents a 7-minute video introducing the museum and the evolution of the idea of freedom and the struggle of Filipinos as a prologue. Gallery 2 traces the events leading to the establishment of the Malolos Congress namely the constitution of Biak-na-Bato, the proclamation of independence at Kawit, Cavite and the decrees of the revolutionary government headed by Gen. Aguinaldo. Its two touch screen monitors display the historical overview of facts, from 1882 to 1899, and sources about the first Philippine Congress (headed by Pedro Paterno, it was convened on September 15, 1898 inside the Barasoain Church) and the events that preceded and followed it. Gallery 3, at the main hall, and the smaller hall Gallery 4 focuses on Malolos, the Constitutional Congress; the Malolos Congress and the Constitution. Gallery 3 centers mostly on the downfall of the Spanish rule in the country and the succeeding events that led to the formation of the Constitución Política de la República Filipina. It also offers a 7-minute light-and-sound presentation, with a diorama with life-size resin statues of the leading figures and prominent delegates of the Malolos Congress – a sitting Emilio Aguinaldo, president of the First Philippine Republic, flanked by key figures of the Malolos Congress. A pew, which is said to have been used during the actual convention of the revolutionary congress, can also be found in this particular exhibit. In Gallery 4 is a list of the names of all the representatives who joined the Congress. There were 193 delegates, none of whom were paid for their work. Only 42 were elected while the rest were appointed. The gallery also has a bust of Don Felipe G. Calderon, who penned the Malolos Constitution. Gallery 5 provides the epilogue and dwells on the theme—Defense of the Republic—by featuring how Filipinos went to war against a new colonizer, the United States of America to defend the republic and the freedom and sovereignty of the people. 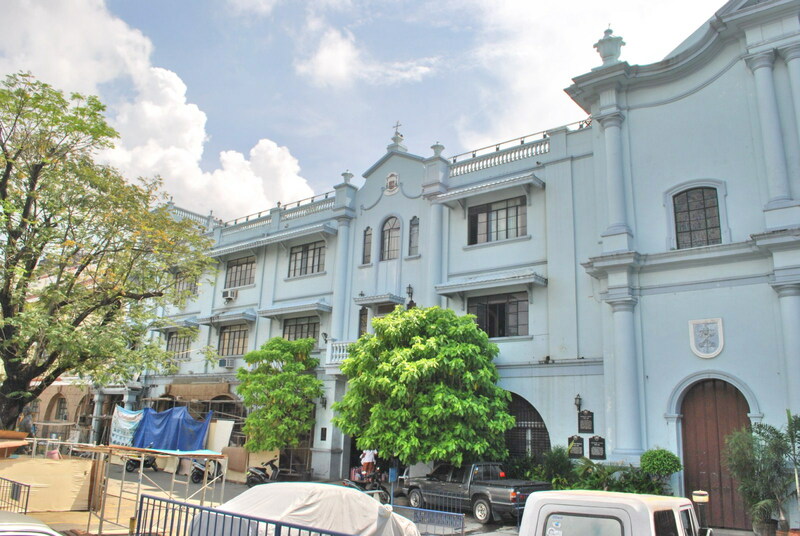 Museum of the Malolos Republic: Barasoain Convent, Paseo del Congreso Road, Brgy. San Gabriel, Malolos City, Bulacan. 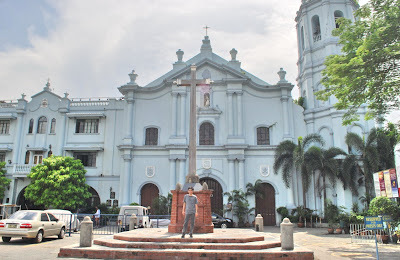 From Ciudad Victoria, our 14-car Automobile Association of the Philippines (AAP) caravan proceeded on the second leg of our day-long tour, this time to Malolos City, the provincial capitol, where we made a stopover at historic Barasoain Church. At the convent, we first visited the Museo Diocesano de Malolos, a museum managed by the Malolos Diocese. It houses relics, artifacts, regalia and religious items containing and illustrating the ecclesiastical history of Central Luzon. The exhibits include the original nineteenth century baptismal records of Bulacan native sons Marcelo Hilario (the Great Propagandist also known as Marcelo H. del Pilar), Francisco Baltazar (he Tagalog equivalent of William Shakespeare also known as Francisco Balagtas) and Gen. Gregorio del Pilar (the “Leonidas of the Philippines”). There’s also a bone fragment of St. Vincent Ferrer encased in glass; priestly robes embroidered with gold-plated silver threads; a Sto. Entierro (meaning “Holy Burial”); a replica of the Black Nazarene from Quiapo Church; and antique prayer cards, church bells, religious statues, candle stands, processional crucifixes and antependiums (altar frontals) from different churches. Museo Diocesano de Malolos: Barasoain Convent, Malolos City, Bulacan. Director: Fr. Vicente Lina Jr.. Open Tuesdays to Saturdays, 8 AM to 4 PM. From Pulilan Butterfly Haven, Jandy and I made our way back to Manila via NLEX which we plan to enter via the Pulilan Exit. Along the way, we passed through the center of Pulilan town and made a short stopover there for merienda, parking our Toyota Revo at the plaza in front of the town’s Church of St. Isidore the Farmer (San Isidro Labrador). The church was closed during our visit and I could only admire it from outside. This church was damaged during the June 3, 1863 and July 19, 1880 earthquakes and was rebuilt by Fr. Miguel de Celis a few years after. Its facade is divided, by pilasters, into a main rectangular and a triangular pediment (with its Augustinian emblem). Its 3-storey bell tower, on the left side, has a balustrade on the second level. From the plaza, we walked, along a side street, to the municipal hall where we had some burgers and soft drinks at a nearby refreshment stand. Across the municipal hall is the Municipal Trial Court Bldg. which also houses the Museo de Pulilan. After merienda,we retraced our steps back to the car and proceeded on our way back to Manila. From Calumpit, Jandy and I entered the town of Pulilan and made a stopover at the Pulilan Butterfly Haven, a popular ecological and swimming resort. Jandy had been here before, during a field trip in February 2005. A haven for butterfly enthusiasts and nature lovers, it has a collection of breeding and flight area for 8 species of colorful butterflies (tree nymph, lacewings, etc. ), an ornamental garden, orchidarium (including the famous vanda sanderiana) and a 1,600 sq. m., butterfly-inspired swimming pool (admission: PhP100/pax), all creating a refreshing and cool atmosphere, plus a museum (Bulacan Doll Museum, admission: PhP50 ) and overnight cottages (PhP1,500). Upon entry, we met up with caretaker Ms. Fe Magtalas who toured us around the Bulacan Doll Museum. Located within the unassuming old ancestral house of owner Ms. Estelita A, Caleon-Aguirre (poetess, CPA and deputy commissioner of the Bureau of Internal Revenue), this museum houses a 17-diorama doll collection that pays tribute to Filipino craftsmanship. Among the historical events depicted in the dioramas are the Birth of Katipunan in Bulacan, the Battle of San Rafael, the Declaration of Philippine Independence, the Biak-na-Bato Republic; the Capture of Calumpit by the Americans, the Japanese Occupation in Bulacan, the Independence Day celebration in Bulacan, the Malolos Congress, and the Defense of Kakarong de Sili in Pandi. The museum also features the Carabao Festival, the Sta. Clara Fertilization Dance in Obando, the fluvial parade of Bocaue, the Good Friday procession in Baliwag, Bayanihan and Pamanhikan (pre-nuptial entreaty ceremony); Alamat (fable) of Ibong Adarana; the folklore of Juan Tamad; the neighborhood cooperative endeavor; and Bulacan industries such as Paombong vinegar (suka) industry, the making of polvoron and other native delicacies, jewelry-making, embroidery and hat-weaving. Pulilan Butterfly Haven: San Francisco St., Poblacion, Pulilan, Bulacan. Tel: (044) 676-1377 and 910-1388. E-mail: pulilanbutterfly@yahoo.com. Website: www.pililanbutterfly.ph. Upon crossing a concrete bridge, I espied the much lower, similarly concreted bridge on the right. This old, now disused bridge was impassable as one span has fallen into the river. I guess I got the right bridge as pictures at the the Bulacan provincial government website depicts it as such. However, looking at it, it begs the question “Was it the actual bridge that was the site of that battle?” “We’re Filipino forces really victorious in that battle?” First, let me state the facts, on the Battle of Calumpit, as I researched it at “Philippine-American War, 1899-1902” (written by Arnaldo Dumindin). After taking Quingua (now Plaridel), Calumpit, only 8 kms. (5 miles) north of Malolos, became the next American objective. Gen. Antonio Luna, however, was nowhere near the town as he left for Guagua to punish Gen. Tomas Mascardo, the military commander of Pampanga, for leaving his post to inspect troops (others say to attend a fiesta or visit a girlfriend) at Arayat (Pampanga). Gen. Mascardo, with around 21,000 men under his command at the time, had been supposed to strengthen the defense of the Calumpit–Apalit Line by providing reinforcements in the area when needed. Luna took most of the defending cavalry and the artillery with him, leaving Gen. Gregorio Del Pilar to counter the advancing American troops. Aguinaldo had ordered Luna to retreat and burn the railway bridge spanning the Bagbag River, but Luna ignored the order. However, on April 23, 1899, Gen. Del Pilar did cut the iron girders of the railway bridge, with the intention of making the bridge collapse once the enemy’s armored artillery transport train, with 6 pounders and rapid fire guns, passed over it. However, the section of the bridge prematurely collapsed, under its own weight, before the train had reached it. Chinese porters pushed the train to the mouth of the river. Col. Frederick Funston, with 6 men, crawled, under heavy fire, across the ironwork of the bridge and, upon reaching the broken span, dropped into the water and swam to the opposite shore, where Filipino trenches were located. Upon reaching the opposite bank, they charged the trenches and killed 25 Filipinos. Other troops promptly repaired the bridge to let their supply wagons cross over the river. By nightfall of April 25, Luna had returned from Guagua with only Filipinos in the barrio of Sta. Lucia holding out against the Americans in the Bagbag sector. Gen. Luna tried to fight and repulse the Americans, but he was eventually forced to retreat, destroying bridges as his troops fell back to slow the American advance. Based on this research, the bridge in question was actually a railway bridge made of iron, not concrete. The bridge in the recent photo I took was probably a more recent replacement but the location may be the same. Here’s an actual photo taken of the damaged railway bridge, then being repaired by American troops, taken after the battle. Aside from the difference in the materials used, I also noticed that the bridge supports are also different in size and shape. Second, there was no Filipino victory in this battle. Probably, the victory being referred to was the April 23, 1899 (not April 25) Battle of Quingua (now Plaridel) where the same Gen. Gregorio del Pilar, with 700 to 1,000 men, halted the advance of 62 Scouts plus a troop of the 4th Cavalry, all led by Maj. James Franklin Bell; or of their subsequent halting of the cavalry charge of Col. John M. Stotsenberg (who was killed together with 6 of his men). This all happened in Quingua, not Calumpit. In spite of these small victories, the Americans still triumphed in the end and took the town. This moment in history deserves a second look ……..
After a jobsite inspection in Calumpit and lunch at a local Max Restaurant outlet in Malolos City, Jandy and I still had time on our hands so we decided to go on a sightseeing tour. 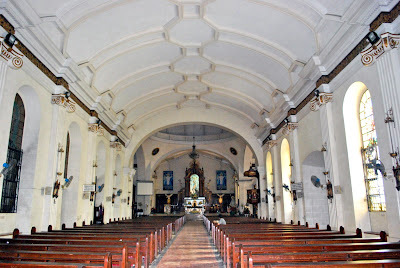 We drove to Calumpit town proper and made a stopover at the Church of St. John the Baptist. Built in 1575 under the supervision of Augustinian Fr. 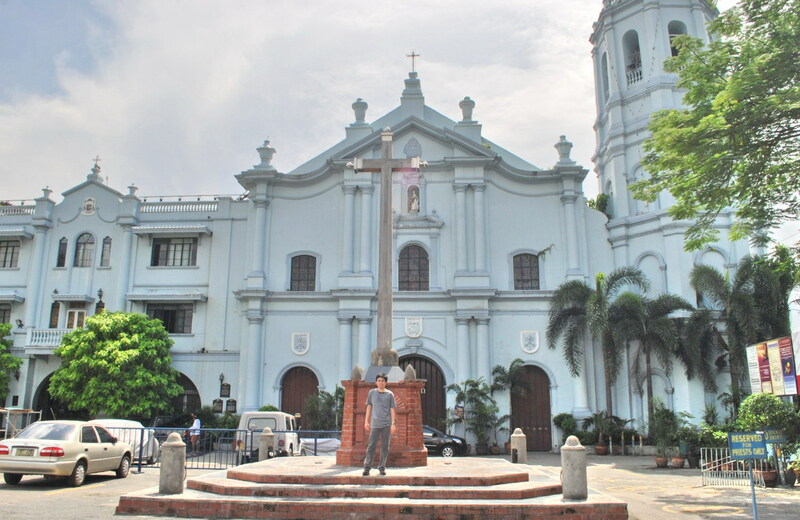 Diego Vivar-Ordonez, this church is one of the oldest in Bulacan. Both church and convent were finished before 1779. It was originally built with underground escape tunnels which led to the river to provide an avenue for escape for priests with the church treasury if attacked by robbers. Revolutionaries and Spaniards are also buried in the tunnels. During World War II, it was Japanese Gen. Tanaka’s last battlefield. Originally built in red brick, recent renovations have plastered it in cement (some portions still show the original red brick). A newer triangular pediment was placed on top of the undulating raking cornice of the original. Four Corinthian columns, resting on pedestals, support the cornice and pediment. Its rectangular facade is divided into three segments. The first level has two rectangular windows on the side panel for balance and contrast. The main entrance has a trefoil arch, embellishments, huge scroll-like decorations and a rose window on the pediment, half-framed by curvilinear moldings, integrated with the second level. Its interior is profusely decorated in the ornate Baroque style. The simple 5-storey, hexagonal bell tower, on its left, was reconstructed in 1829 by Fr. Antonio Llanos, but was burned by revolutionaries in 1899. 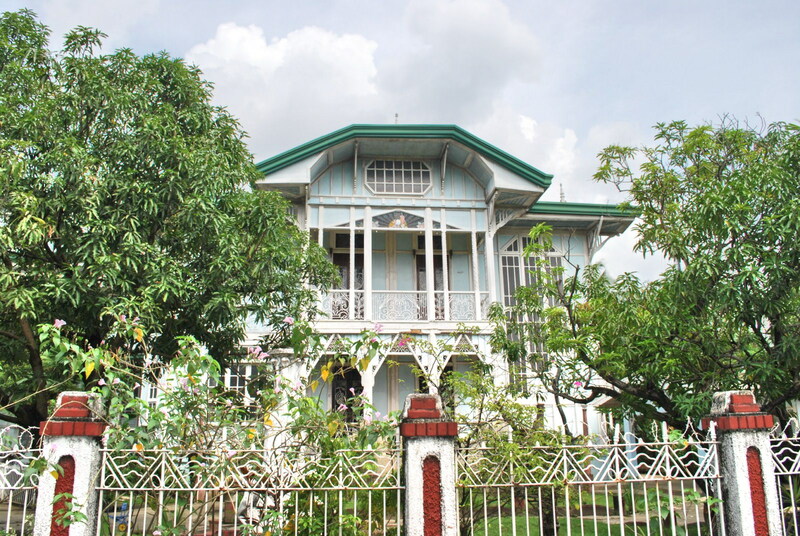 Located within the Pulilan Butterfly Haven, a popular ecological and swimming resort, this unassuming old ancestral house of owner Ms. Estelita A, Caleon-Aguirre (poetess, CPA and deputy commissioner of the Bureau of Internal Revenue),houses the Bulacan Doll Museum, a museum exhibiting a 17-diorama doll collection that pays tribute to Filipino craftsmanship. We were now on the final leg on our Lakbay Norte 2 tour and our final destination was the marble quarrying, first-class municipality of San Miguel de Mayumo, a town rich in history within the equally historic province of Bulacan. Our special Victory Liner bus first dropped us off at the Church of St. Michael the Archangel where we were welcomed by Mr. Jose G. Clemente and Ms. Amelia Aquino, both of the Bulacan Tourism Convention and Visitors Bureau (BTCVB); Mr. Jimmy Corpuz, head of the National Historic Conservation Society; and municipal tourism officer Ms. Divina Quetua. This Baroque-style church, with its statue of St. Michael the Archangel slaying the dragon at the center panel of the pediment, was built (or rebuilt) in 1848 by Fr. Juan M. Tombo and was completed in 1869 by Fr. Francisco Arriola. Maximo Viola, the financier of the printing of Rizal’s Noli me Tangere, is buried in a vault within the church. After the church tour, we all cross the street to pay a courtesy call on Mayor Roderick Tiongson at the municipal hall (built in 1874). Being an hour behind schedule, we had no time to tour, on foot, San Miguel’s 25-30 ancestral houses (the town is called the “Vigan of Bulacan”) scattered around the town proper as we had to drop by Biak-na-Bato National Park, site of the Biak-na-Bato Republic. These bahay na bato were built with different styles of architecture and colors during the Spanish and American eras, all existing testimonies to the abundance and prosperity of the past. Instead, we did a slow tour via our bus, along the town’s narrow streets, with Mr. Clemente commenting on each house we passed. 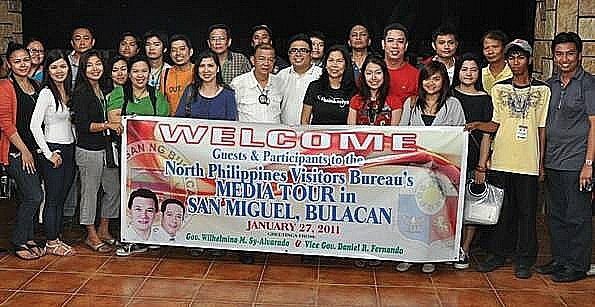 In the past, landed barons running haciendas in Central Luzon built their grand residences or vacation houses in San Miguel de Mayumo where they hosted lavished parties or soirees. We arrived at the 2,117-hectare Biak-na-Bato National Park by 5 PM. Our 1-hr. tour took us past Gen. Aguinaldo Cave (Emilio Aguinaldo‘s headquarters in 1897 and site of the Biak-na-Bato Republic) all the way up to Bahay Paniki Cave, located upstream from the Balaong River. Probably the largest cave in the area, the cave has a rather deep natural indoor swimming pool fed by an underground stream. Thousands of fruit bats fly in and out from dawn and dusk but we were not to witness this as approaching darkness would make our return trek difficult. It was already dark when we returned to the park’s new pavilion for a snack of ensaymada (a brioche made with butter and topped with grated cheese and sugar) and arroz caldo (a rice porridge flavored with chicken) After a short press briefing and photo ops, we all returned to bus for our 2-hr. return trip to Manila. However, the grateful town and its people wouldn’t let us go without bringing home some pasalubong of the town’s famous delicacies. Waiting for us at the bus were pastillas de leche (delicious, mouth-watering candy made from sugar and pure carabao’s milk), tableya (old fashion Philippine chocolate), minasa (cassava cookies), yema balls (a sweet custard candy made with condensed milk and egg yolks) and chicharon (fried pork crackling). 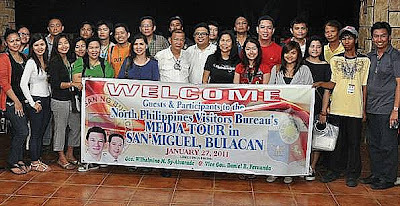 Bulacan Tourism Convention and Visitors Bureau (BTCVB): c/o Ciudad Clemente Resort, Paombong Bulacan. Mobile number: (0927) 669-5655. E-mail: joclemente01@yahoo.com. From the basilica, we made a walking tour of the city’s Kamistisuhan Houses which are mostly located along Pariancillo St. 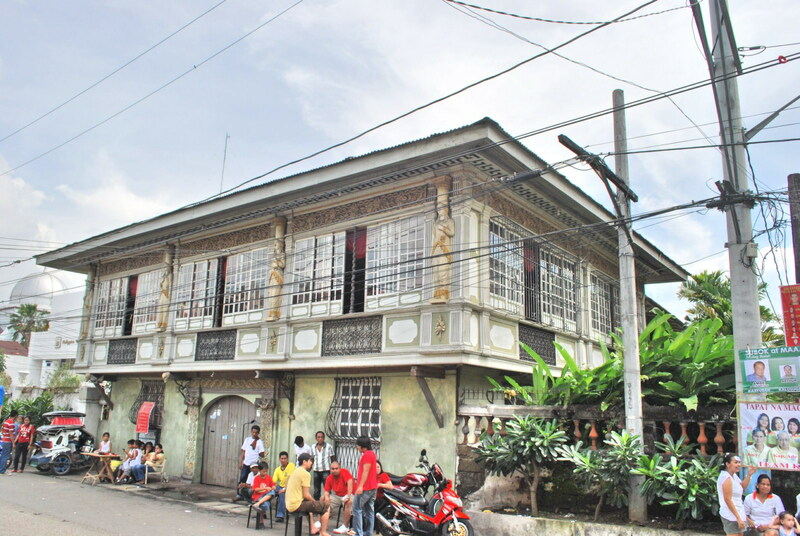 These houses, built by landed Filipino-Chinese families, typify the intricate architectural design of Spanish buildings. When Pres. 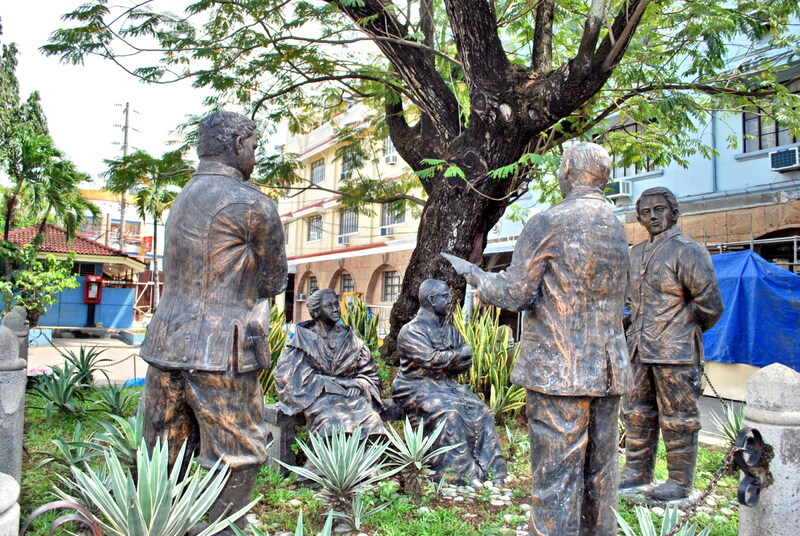 Emilio Aguinaldo moved the seat of government to Malolos, he established the various cabinet offices at these houses. Some of these houses are still inhabited by the descendants of the original owners and in a good state of preservation. Others have been demolished or have been converted to commercial establishments. The beautifully restored Adriano-Vasquez Mansion, a perfect example of adaptive reuse, once housed Aguinaldo’s Gobierno Militar de la Plaza. Now the Meralco Bldg. (Meralco bought it in 1995 and restored it in 1997), it has a filigreed cast iron staircase that wind up to the balustered rampart. The 2-storey Bautista Caryatid House, behind the Adriano House, has ornately sculpted Neo-Classic touches and was built in 1855 and redecorated in 1877 in the French Art Noveau style. 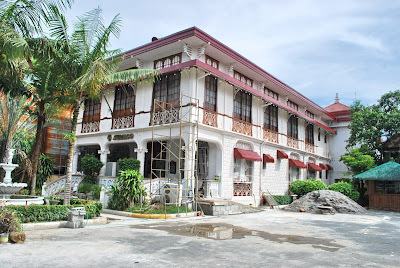 It was the Secretaria de Fomento and home of Antonio Bautista, Aguinaldo’s Secretary of the Interior. It contains heirloom memorabilia including the original KKK flag and here, Jose Rizal and Marcelo H. del Pilar spoke to the 21 women of Malolos on June 27, 1892. Through the years, the house has been used as a municipal hall, a primary school and a barracks for Japanese soldiers. Restored in the 1970s by descendant Basilidez “Dez” Bautista, its ground floor has an arched double door while the second floor’s columns are decorated by unique caryatids. The Erastro Cervantes House, beside an old movie theater, once housed Aguinaldo’s Department of the Interior. The Arcadio Ejercito House housed Aguinaldo’s Department of War. The Lino Reyes House, across the side entrance of the cathedral, once housed Aguinaldo’s Secretaria de Exterior. Built by couple Lino and Maria Reyes probably after they were married in 1892, it was progressively renovated in the 1930s. The house has an octagonal rose window and a weather vane on top of the roof. A sad case in point is the Ponciano Tiongson House which was demolished in the 1980s. Formerly located across the Erastro Cervantes House, it had intricate balustered windows and once served as Aguinaldo’s Commisaria de Guerra. An internet cafe now stands in its place. Other ancestral houses were built during the early American era. 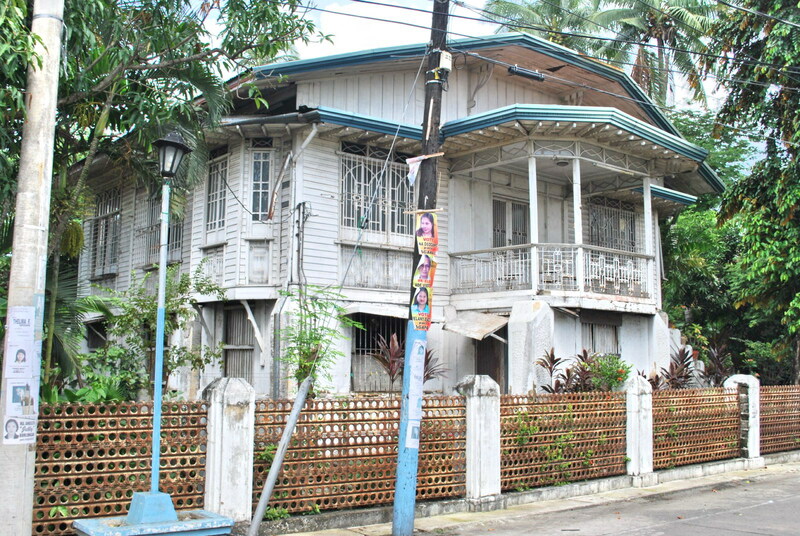 The Hermogenes Reyes House, located a few blocks from the cathedral, was built in 1904 by couple Hermogenes and Teodora Reyes. The Dr. Luis Santos House, built in 1933 by an EENT doctor, has a spacious front garden with a fountain with a pair of lovely nymphs. The house sports a pastel blue and white, Art-Deco-inspired facade. Adriano-Vasquez Mansion: Pariancillo St., Malolos City, Bulacan. Arcadio Ejercito House: cor. 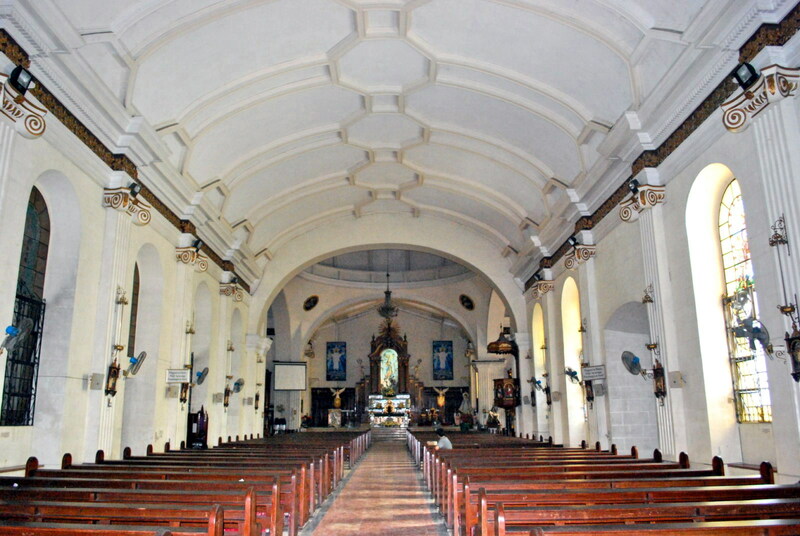 Estrella and Pariancillo Sts., Malolos City, Bulacan. Erastro Cervantes House: Pariancillo St.,Malolos City, Bulacan. Hermogenes Reyes House: F.T. Reyes St. (formerly Calle Electricidad), Brgy. Sto. Nino, Malolos City, Bulacan. 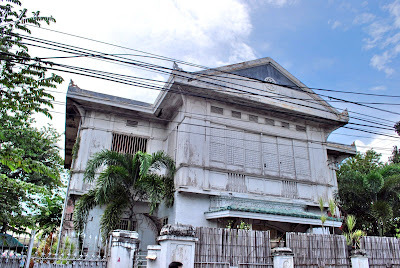 Lino Reyes House: Estrella St., Malolos City, Bulacan. 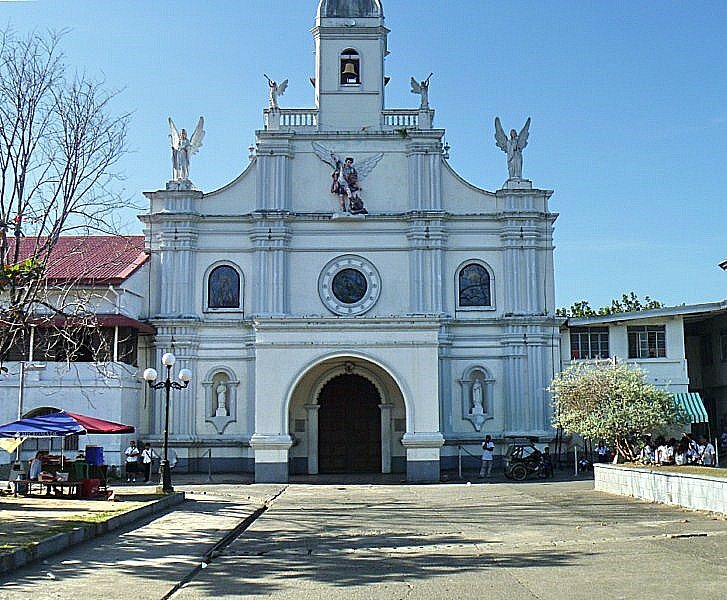 After our Barasoain Church visit, Jandy and I proceeded on our way to the nearby Minor Basilica of Our Lady of the Immaculate Conception, the ecclesiastical seat of the Diocese of Malolos. Located in front of the city hall, this Neo-Classical church, and its convent, were first built with light materials in 1591, rebuilt and enlarged in 1691 by Fr. Roque Barrionuevo, rebuilt with stronger materials in 1734 by Fr. Fernando Sanchez and completed in 1740 by Fr. Juan de Meseguer. Fr. Jose de Vivar did minor restorations in 1753. Both were destroyed by fire in 1813. From 1963, several restorations were pursued by Engr. Alfredo Aldaba, affecting the facade, dome, transept and main altar. The present church was started in 1819 by Fr. Melchor Fernandez and consecrated on October 14, 1826. Severely damaged during the June 3, 1863 earthquake, it was restored from 1859 to 1872 by Fr. Ezekiel Moreno. The convent was damaged during the July 19, 1880 earthquake, restored in 1883 by Fr. Juan M. Tombo and completed in 1884 by Fr. Felipe Garcia. It was the official residence (Palacio Presidential) of Pres. Emilio Aguinaldo from September 10, 1898 to March 29, 1899. The convent was reconstructed in 1975. In 1976, both church and convent were blessed by Rev. Bruno Torpigliani, the Apostolic Nuncio to the Philippines. The basilica has a moderately-decorated, symmetrical facade divided into 3 segments by superpositioned Doric columns and dominated by large, semicircular arched openings on the first level. The triangular pediment, decorated by a stylized Augustinian emblem at the center, is topped by acroteria and torch-like finials. The horizontal Doric frieze is decorated with triglyphs and the fluted pilaster-flanked, statued niche is topped by a segmented canopy crowning the tilted frame of the center window. The basilica has a slender, 4-storey bell tower on its right. It used to have a triangular cone which was replaced, during the basilica’s renovation in 1970, by a concrete statue of the Immaculate Conception (donated by Amparo Bautista). In front of the basilica (at the right side of the plaza) is a 12-m. high siar tree (Peltophorum pterocarpum), now known as the Kalayaan Tree. 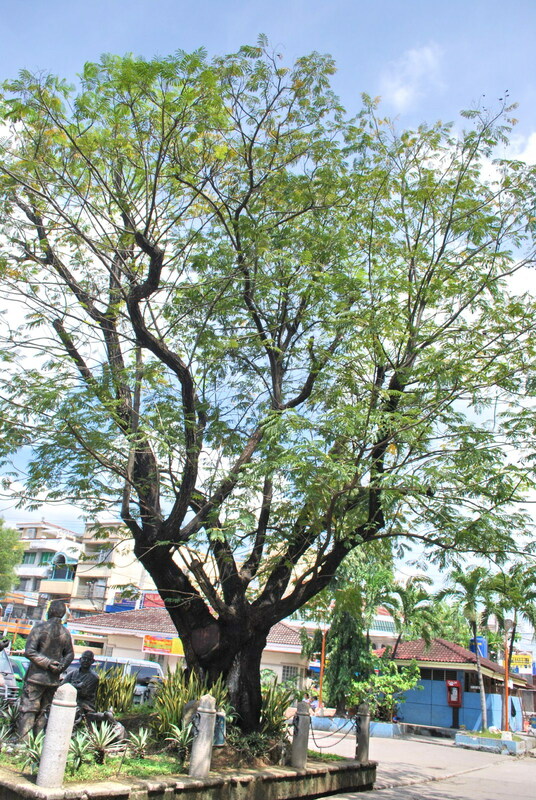 It was said to have been planted by Gen. Aguinaldo during a lull in the convention. proceedings. Under this tree is a monument depicting a meeting of Filipino revolutionaries Gregorio del Pilar, Isidoro Torres, Don Pablo Tecson, Fr. Mariano Sevilla and Dona Basilia Tantoco.